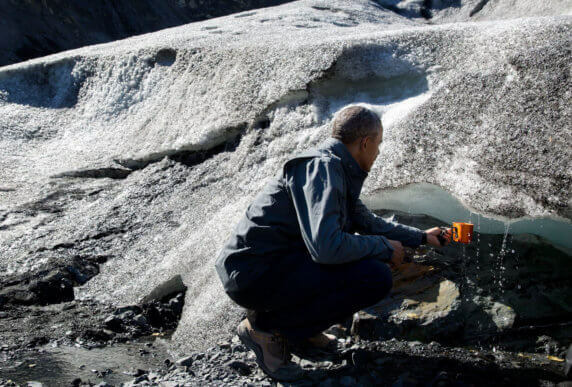 President Obama collecting melt runoff from the ice of Exit Glacier in Alaska. This past summer an important thing happened in America’s Arctic. President Obama, who previously had only stopped in Alaska to refuel Air Force One, decided to spend some quality time with us to explore our magnificent landscapes. And he fell in love—not only with our jaw-dropping scenery, but also with our vibrant Alaska Native cultures. A friend of mine who works in Washington, D.C., said when she was in the West Wing of the White House a few weeks ago she was startled to see the walls lined with photos of the President’s visit to Alaska. He clearly was impressed. I can’t help but think that images of Alaska were at the forefront of the President’s mind when he traveled to Paris to secure a binding worldwide agreement to protect our environment as our planet’s warming accelerates. Here in Alaska, America’s Arctic, warming happens more than two times faster than the average global rate. Summer sea ice has been reduced by 40% since 1979, and the Arctic Ocean may be completely ice-free during summers starting this century. Arctic communities are already experiencing firsthand the challenges to their homes and food supplies as the climate rapidly changes. Villages face relocation as shorelines erode without sea ice as protection from heavy waves. Failed hunts associated with loss of sea ice have also caused food shortages. Arctic flora and fauna are particularly vulnerable in the face of these changes, as they have adapted exquisitely to the extremely harsh conditions in the Arctic. The weather alterations, disappearing ice ecosystem, and warming temperatures pose an existential threat to much of the Arctic’s wildlife. As the sea ice recedes, numerous nations are looking to expand industrial activities into Arctic seas and coastal waters. The U.S. Geological Survey estimates that up to 13% of the world’s undiscovered oil and up to 30% of the world’s undiscovered gas reserves are located in the Arctic. The world’s largest corporations unabashedly announce the “opening” of the Arctic as a historic moment, rich with opportunity for profit. Oil companies have been fighting for years to drill in the Alaskan Arctic (in the Beaufort, Chukchi, and Bering Seas) and the Russian Arctic (in the Sea of Okhotsk off the coast of Kamchatka). And there is tremendous pressure to build new transportation links—ports, rail lines, and roads—to move coal, oil, and gas out of these pristine environments to manufacturing centers around the world. Commercial shipping companies are plotting new shipping lanes across the “opening” Arctic. This increased ship traffic will dramatically ramp up disturbances to marine mammals, diesel emissions, and the risk of catastrophic oil spills. But there is hope for the Arctic. If we can slow the rate of climate change, adopt stringent restrictions on discharges into Arctic marine waters, and develop protected areas both on land and in the seas, then we will be able to protect one of the last great wilds on our planet. Indeed, what happens in Paris this week is important. And I’m glad President Obama will have first-hand images of Alaska and its peoples on his mind as he argues to reduce global greenhouse gas emissions to reign in climate change.